Walk through the vendor hall at the annual National Association for the Education of Young Children (NAEYC) conference, and you might think we’re way past the days of manila folders and chin-high stacks of homework. From educational videos to iPad apps and interactive whiteboards, there is so much technology at our fingertips. But how many tools actually empower educators to create a focused and caring environment? For the record, we’re not knocking early childhood education (ECE) technology. After all, we’re an ECE support platform and child care app, and that’s a badge we wear proudly. But in an effort to create the “the perfect tech-enabled classroom,” it seems that many of us (vendors, administrators and practitioners alike) have missed the point. We’ve all seen the terrifying research on stress and anxiety in today’s infants, toddlers, and young children. But what about our caregiving staff? A recent study from the American Federation of Teachers found that today’s educators have twice as much work stress as the average US employee. And the consequences are serious, to say the least. A 2014 study of over 2,000 Head Start staff in Pennsylvania found that 24% reported clinically significant levels of depression. Your staff’s mental health absolutely has an impact on the children in your care. Focusing on the urgent needs of today’s youngest children, while turning a blind eye to the people who care for them is like pouring water into a bucket with a hole in the bottom. Care providers can’t give what they don’t have. The good news is, technology—when used intentionally—can make a world of difference. In the business world, it’s a known fact that 30-60% of a frontline manager’s time is spent on overcomplicated administrative tasks. If you’re piling on more technology simply because it’s the newest, shiniest thing, you could end up pushing your people to the brink of burnout. But what if you could help your team win back their time? How many more precious minutes and hours could you and your staff spend interacting with the kids? Without the stress of a to-do list that will follow them home at night, caregivers will have more mental bandwidth and can make better decisions about the things that matter most. There’s no reason why people who want the same thing can’t work together. Parents of young children are facing their own battles. But better communication powered by uncomplicated tech can help alleviate parental stress (you know, the kind that spills over onto the kids and makes life as a caregiver even harder). And as a major bonus, proactive parent communication is cited by many caregivers as a task that gives them a greater sense of control at work. 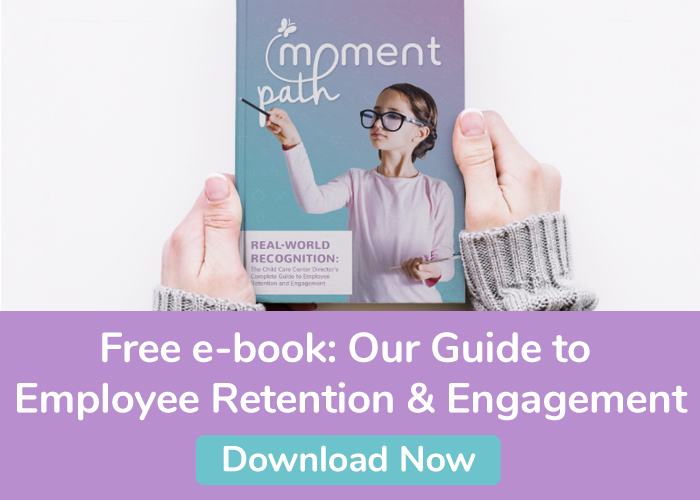 What if your team could harness that sense of empowerment every day, without ever having to open their frenzied inboxes or switch between a dozen different systems? Using a child care app to send a quick photo or video update to parents and guardians is a great way for your caregiving staff to build trust. And getting a quick “Thank you!” (or heart-eyed emoji) in return is a simple yet powerful way to build confidence within the team. Parent or teacher, at the end of the day, all any of us wants is to know we’re doing a good job. If we want to nurture a generation of curious adults bold enough to change the world, we need to free our educators and caregivers to be the best role models they can be. The right technology can help make that happen. But like any tool, the impact lies not in the tool itself, but in the way you wield it. Before you think about any feature-packed software, program or app, first think about what your caregivers, parents, and children really need. It’s the only surefire way to have all the tech you need, and none of the tech you don’t.